In October 2017, Solar Energy International (SEI) taught a 2-week intensive battery-based class, partnering with Rural Renewable Energy Alliance (RREAL) at their facility in northern Minnesota for technicians from Africa. This training was part of RREAL and the Northeast MN Synod Women of the ELCA’s Skip the Grid effort to bring solar electricity to hospitals in West Africa, and followed a large PV diesel hybrid installation at Phebe hospital in northern Liberia. Several of the hospital technicians were invited to attend this course, and were joined by students from Zambia and Nigeria. SEI hired me, co-founder of Remote Energy and former SEI staff member, to customize the curriculum for the students and to be the PV technical trainer for the class which was supported by Outback Power. The “Dynamic 5” – or D5 as the five students called themselves – came to the class with the desire to bring solar back to their communities, which largely lack electricity. Because this was a small group of five students with a shared common vision, I was able to set up the class in a way that allowed the students to actively participate and use their new growing vocabulary of solar terminology each day to teach each other. Each day the students came to class with a new solar application in mind, as they learned about what is technically possible. Muzalema, a Mandela Washington Fellow, came to the course with the single focus of learning how to design an off-grid freezer so she could freeze fish for the aquaculture women’s center that she had helped start in Zambia. The women in this group are taught about aquaculture, given fingerlings to raise, and then the cooperative buys the fish back once raised to boost enterprise and food in the community. Once in class, other ideas started percolating, and she saw another application for DC solar lighting for the maternal health clinics she works with which do not have electricity. Another organization she is active in, Safe Motherhood Alliance, provides maternal kits already that women have to purchase before giving birth which include sterile bedding, a sterile razor – and a candle to see if at night. Off-grid solar lighting would eliminate the need for candles and provide better lighting for the delivery room. Muzalema was concerned though, that if the local fish center and the clinic were the only buildings in town with solar electricity, that many of the community members would try to bring their phones there to charge resulting in the failure of the batteries. Her classmates agreed, and had already experienced similar problems in their communities, so the class decided to design a solar phone charging station as a class exercise which would charge phones from the sun instead of the more common petroleum charging stations. Bobo and Jojo are both technicians at Phebe hospital, and had participated in the earlier RREAL installation. They are also part of a team of technicians that installs Outback Power systems on smaller clinics. Because they needed specific equipment training, Outback generously donated funds, and their product technical curriculum, to the project, which allowed the purchase of live equipment, and the ability to trace wires, commission, and learn programming on a system. Wole, from Nigeria, was the human calculator for the group - trained as a nuclear engineer – he would do all calculations in his head. By mid-week had declared he wanted to make a career move to solar and saw many applications back in his country of origin. Dikar, originally from Liberia, was the glue for the class with his extremely funny demeanor and ability to make us all double over laughing. Still just saying his name brings a smile to my face. Because this was a small class – on the final day, the students were required to give a presentation to the RREAL staff and their classmates on a project of their choice that they wanted to install in their country. They were asked to make it as realistic as possible and to demonstration as much of their new found solar knowledge as possible. Wole, from Nigeria, chose to demonstrate the solar charging station. He discussed the benefits of using solar in this application versus the more common method of using petroleum generators. He walked through his design parameters and explained his choices, he drew out a full schematic – adding future expansion needs and some creative theft protection ideas as well. Bobo and Muzalema role played a scenario of making a presentation to a UN commission of Health Ministers, proposing the idea of adding 20 new Outback Power systems to maternal health clinics. They used the live system in class to talk about how the system would work, and to explain the components function. 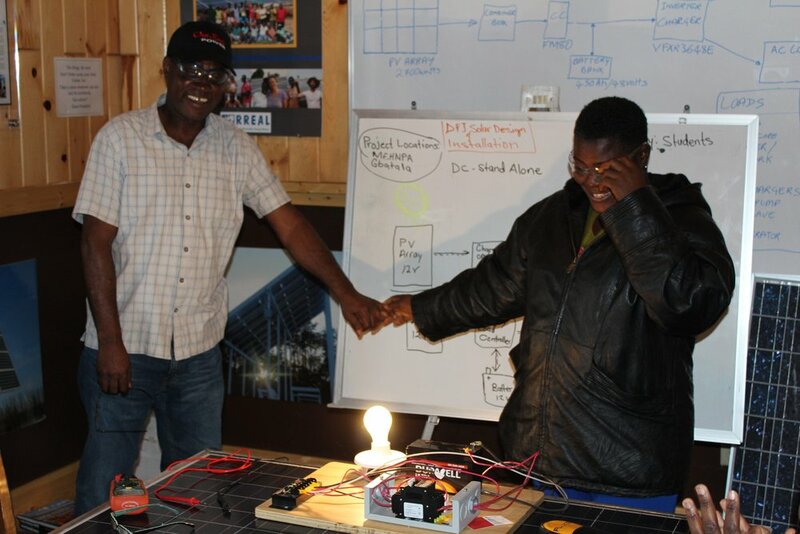 Dikar and Jojo role played the scenario of giving a presentation to elders in their village proposing a small DC lighting system for a school in their village so that students they knew could study at night. Their business name was D & J Solar – and I suspect that this business will become a reality soon. The Lutheran Women of Backus, MN generously provided housing for the participants and lunches each day at the class. My compliments go to BJ and Jason at RREAL, who are a model organization reaching many people with energy assistance. Their Skip the Grid efforts are now focused on a second project for Curran Hospital in Liberian, and the two trainees will be part of the installation crew again next year.